Peter Pan once implored the readers of his adventures to clap their hands if they believed in fairies. 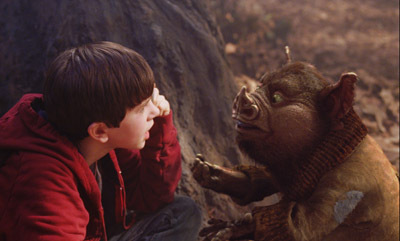 Well kids, in The Spiderwick Chronicles, not only will you be resuscitating the fae, but you’ll be applauding brownies, boggarts, goblins (- hob and otherwise), ogres, sprites, sylphs and griffins throughout this remarkable tour through the Unseen World of magical creatures. 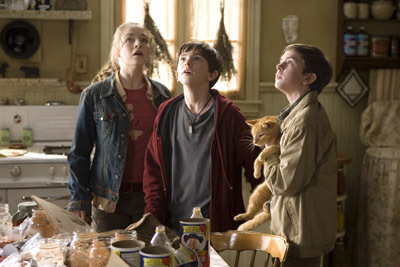 The film is based on a set of very popular books by Holly Black and Tony DiTerlizzi, which involve the adventures of the Grace family. The film introduces newly-separated mother Helen driving her three kids, eldest daughter Mallory, and twins Jared and Simon to their new home in New England. The separation is a thorn in the side of resentful Jared, who not only simmers with silent fury at the new life thrust upon him, but is more than willing to blame his mother for all their misfortunes. 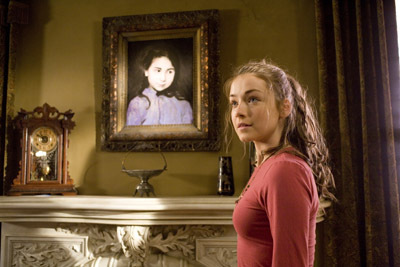 The Graces arrive at the Spiderwick Estate, an inheritance handed down to Helen by her institutionalised aunt Lucinda, and they find the Northeast equivalent of the Addam’s Family house, complete with tall, spooky towers, gloomy atmosphere, and loads of secrets. 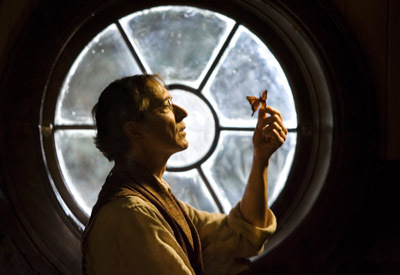 The main one being a particular item hidden away in the derelict laboratory of their ancestor, Lucinda’s lost father, naturalist Arthur Spiderwick, who, decades before painstaking and lovingly composed a book of the wonders of the Unseen World of magic he had been able to infiltrate. 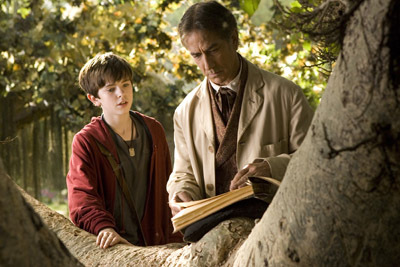 “Arthur Spiderwick's Field Guide to the Fantastical World around You” is bound and sealed with a very dire warning note against reading the book which the curious and heedless Jared (- in a nod to an old Eddie Murphy routine, the house actually tells Jared to leave) promptly discards, breaking the seal without a second thought. 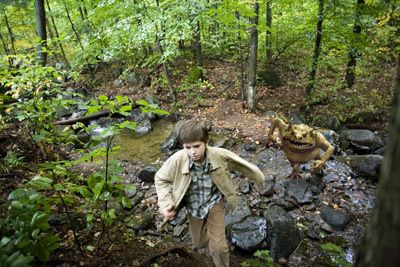 Instantaneously, Jared senses odd things afoot and meets the diminutive guardian of the book, a Brownie called Thimbletack. And because Jared isn’t freaked out enough by the sight of Arthur Spiderwick’s inches-tall assistant, once Thimbletack discovers that Jared has opened the book, some rage issues turn the sweet, loyal Brownie into a much larger, slightly homicidal thing called a Boggart, who is only appeased with honey and saltines (- Hm, same thing works for me…). 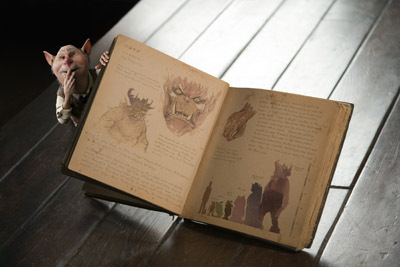 Apparently, the opening of the book also released knowledge of its whereabouts to the entirely homicidal ogre, Mulgarath, who will stop at nothing to possess the book which will give him unstoppable powers over man and beast. He deploys his goblin minions to terrorise the Grace family in his quest to get into the charm-protected Spiderwick Estate and grab the book. It is up to the three siblings to overcome their differences and band together to protect each other, discover Arthur Spiderwick’s secrets, and stop Mulgarath. This film was a lot of fun. A real treat. While neither as high-minded or complicated as other popular fantasy book series adaptations, I enjoyed the relative lack of complication. 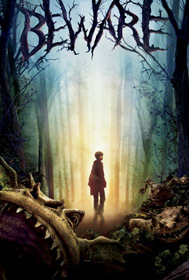 The Spiderwick Chronicles had all the fun and magic of the Harry Potter films, minus the Dickensian teenage angst. Not that there isn’t angst; Jared’s struggle with his parents’ divorce is completely believable without ever making me want to send him to his room without his PSP. The story of the allegedly daft Lucinda Spiderwick, who, as an 86-year old woman still yearns for her missing father, is genuinely touching. The writing here is clear and smart, never talking down to its audience, while still keeping in mind its youngest viewers. There are plenty of clever and funny moments. The dialog, in part written by John Sayles, and directed by Mean Girls and Freaky Friday’s Mark Waters, feels real to the vernacular of a trio of young teen siblings. The characters, both fleshly and computer-generated are wonderfully realised. The twins are polar opposites; Jared is rough-edged in visible pain over his unwanted new situation, while Simon is bookish and keeps an even keel (“I don’t do conflict”). Older sister Mallory is a feisty, fencing firebrand who plays surrogate mom to her younger brothers while their mother copes with her despair. There is a lovely chemistry between the three siblings, even when they bicker. Both twins are played by the wonderful Freddie Highmore, whose double act puts Patty Duke’s in the shade. It’s a great performance by the young actor; each brother is completely individual in action, voice and tone. I particularly enjoyed his Jared, as the more complex character with a thread of malice laced through his misery. 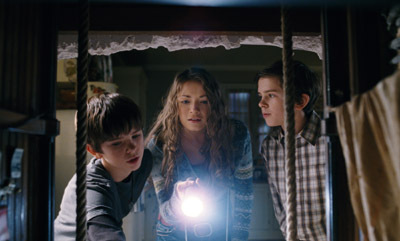 Sarah Bolger is wonderful as the courageous Mallory. Bolger has a wonderful charm and is going to be terrifically famous very soon. (PS: Both Highmore and Bolger are born in the United Kingdom, but handle the northeastern American accent excellently).The brilliant Mary Louise Parker lends credibility to the thankless role of the kids’ unhappy mom. 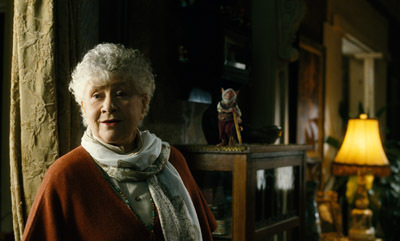 David Strathairn is perfectly cast as Arthur Spiderwick, who is quite literally taken away by the enchantments of the magic world he discovers; and as his daughter Lucinda, the legendary Lady Olivier, Joan Plowright, does a beautiful turn. 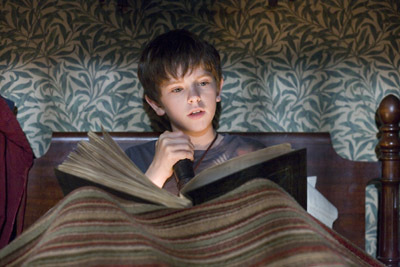 Of course, the excellent special effects must be noted; most amazing would be the flawless capture of both Grace twins as played by Freddie Highmore. Between Highmore’s great work and seamless special effects, you’ll quickly forget that you’re looking at the same person. They interact with each other constantly in the same frame and there’s never one off movement. 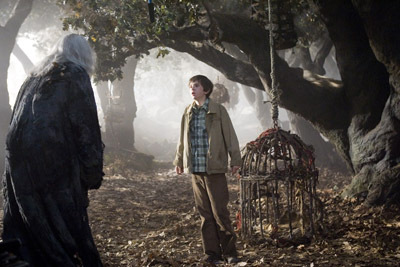 Spiderwick’s griffin will no doubt be compared to Harry Potter’s Buckbeak, but here the creature looked more organic than its predecessor and his flight was much more exhilarating. 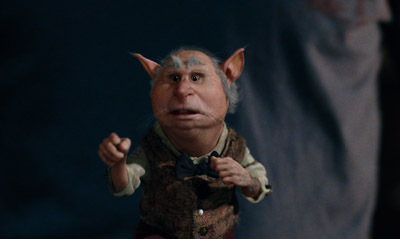 Thimbletack, played by Martin Short, is adorable as the harried, faithful assistant to Spiderwick; he resembles a very small, wizened old man until rage turns him into a vat of growing green boils. I’ll take Thimbletack over H.P.’s Dobby any day. Further on the comic side are the goblins, clearly meant to appeal to the little ones, they are the most broadly rendered (- and the least effective). 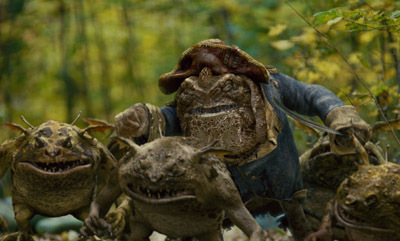 Seth Rogan voices Hogsqueal, a slobbish hobgoblin who would really like to exact revenge on Mulgarath for the murder of his family, but can’t get up the gumption, or give up bird-hunting long enough to do so. 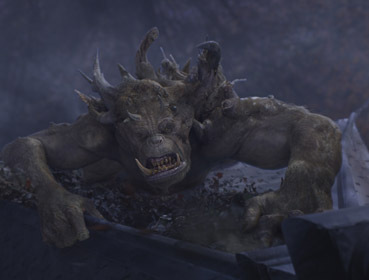 Not at all funny was the ogre Mulgarath, who in his final form is about 8-feet tall and quite frightening. 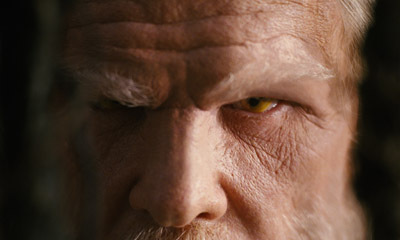 Nick Nolte embodies the evil shape-shifter, and his graveled voice is put to the best use I’ve heard in ages from him. 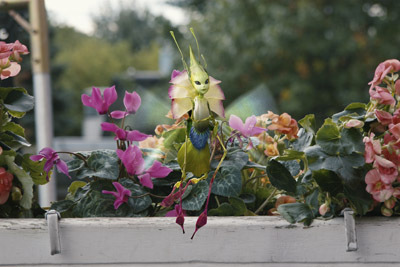 The creatures are also beautiful; the flower sprites that protect Lucinda are graceful and dreamlike, and the guardian dandelion sylphs are in turns breathtaking and startling. 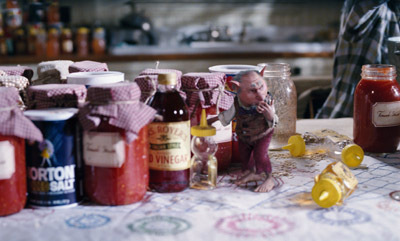 Spiderwick’s flashback sequences are beautifully shot in a sepia wash that occasionally overexposes the frame to look like an antique photo. The score by James Horner is sufficiently rousing and heroic. I would love to see this film again in IMAX 3D as it is going to be released. Yes babies, it was so much fun I’d see it again. I thought it was charming, clever and had some gorgeous edge-of-your-seat adventure. 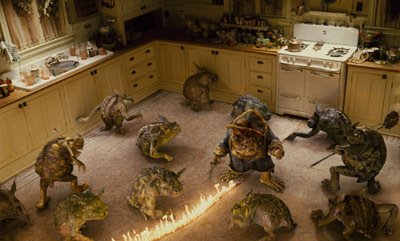 Some Temple residents voiced concern that it may be a bit too intense for the youngest viewers, but a) it is rated PG, and, b) I can’t say for other kiddies, but I know as a baby deity, I would have loved a rip-roaring movie like this. 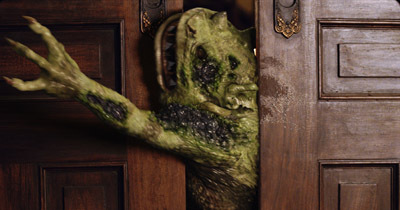 It’s not perfect; the first moments with the Grace’s drags a little with the wallowing in their dysfunction, and as much as I enjoyed Mallory’s sword fight against the goblins I kept wishing she would just get in the house, but those miffs are minor. 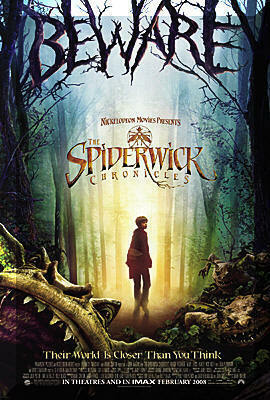 I hope The Spiderwick Chronicles does well; it really is a great family film in the best sense - everyone can enjoy it. Do yourself some good, find a small person and go see. 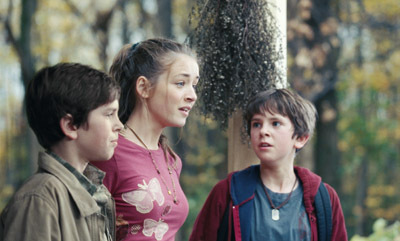 The stars of The Spiderwick Chronicles, Freddie Highmore, Sarah Bolger and Mary-Louise Parker stopped by the Temple. Click here to dig the chat.